In this provocative book, Andrew Bacevich warns of a dangerous dual obsession that has taken hold of Americans, conservatives, and liberals alike. It is a marriage of militarism and utopian ideology--of unprecedented military might wed to a blind faith in the universality of American values. This mindset, Bacevich warns, invites endless war and the ever-deepening militarization of U.S. policy. It promises not to perfect but to pervert American ideals and to accelerate the hollowing out of American democracy. As it alienates others, it will leave the United States increasingly isolated. It will end in bankruptcy, moral as well as economic, and in abject failure. 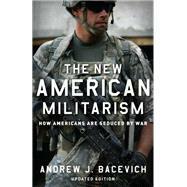 InThe New American Militarism, Bacevich examines the origins and implications of this misguided enterprise. He shows how American militarism emerged as a reaction to the Vietnam War. Various groups in American society--soldiers, politicians on the make, intellectuals, strategists, Christian evangelicals, even purveyors of pop culture--came to see the revival of military power and the celebration of military values as the antidote to all the ills besetting the country as a consequence of Vietnam and the 1960s. The upshot, acutely evident in the aftermath of 9/11, has been a revival of vast ambitions and certainty, this time married to a pronounced affinity for the sword. Bacevich urges us to restore a sense of realism and a sense of proportion to U.S. policy. He proposes, in short, to bring American purposes and American methods--especially with regard to the role of the military--back into harmony with the nation's founding ideals. In a new Afterword, Bacevich considers how American militarism has changed in the past five years, particularly under Barack Obama, who ran for president with a campaign based on "Hope" - hope for change and for a new beginning. Nowhere were those hopes greater than with regard to U. S. military policy. And yet, Bacevich powerfully suggests, the attitudes and arrangements giving rise to the new American militarism remain intact and inviolable as ever. Andrew J. Bacevich is Professor of History and International Relations at Boston University. A graduate of West Point and a Vietnam Veteran, he has a doctorate in history from Princeton and was a Bush Fellow at the American Academy in Berlin. He is the author of several books, including Washington Rules: America's Path to Permanent War, and the New York Times best-seller The Limits of Power.